I am sharing this to warn others of how to be wise while searching for online jobs out there. There are many online jobs available and online working platforms you can choose from but you really have to take your time before submitting yourself to something especially you are not familiar with. This is my story about how I got scammed through an online data entry clerk job offered to me through an online platform. And I hope and wish that through this post I can warn others as well so they will not experience this kind of scam. I got pregnant last year. I stopped working early because I got pregnancy complications. So I was left with only a good amount of EI (Employment Insurance) premiums coming from the government. I was making $15/HR as a service crew in McDonald’s but with EI, I am only receiving half of that amount. Still better than nothing and I consider myself lucky to be in Canada (originally I came from the Philippines) and got this special kind of benefit most other countries don’t provide. So, to make ends meet I tried to find some online jobs. I tried all the working online platforms and that time there were some like Elance, Odesk so I signed up and tried my luck as a freelancer. I have to admit that I don’t have much knowledge in terms of being a freelancer. Yes, I love to write and can navigate some computer applications, basically. I looked for the job lists and applied to several jobs like data entry, ad poster, virtual assistant, etc. And then there’s this one job that I thought will actually make my dream come true having an online job for real. The online data entry clerk job that was posted on Elance replied back to me and told me that I am qualified and invited me for an interview. A guy interviewed me through Skype, I was prepared but surprisingly the interview is only through chat on Skype. I was really excited to take the job as it is very promising like you can work from home literally. The job details promised to pay me $15/hour which makes me think will be very helpful for me. Besides, that’s what I wanted and that’s what I am hoping to be and I see myself as I cuddle and play with my son at home and have time to finish preparing and cooking our dinner in the convenience of our own home. Who doesn’t like those things especially for a first time mom? And most especially when you wanted to save money from expensive nanny and day care services? And absolutely when you are scared for your own child not getting the best attention, care and love you wanted those other people (you don’t really know) cannot certainly provide? So. I opted in. My first job was easy. I just did a spreadsheet, a list of employees profile that includes their names, addresses, phone numbers, and there was this blank column which has a label, activation code. And then my supervisor told me that we have to get those activation codes from a company but we have to pay it first. It felt real because there was a contract coming from Koc Holdings and I googled it and it sounds legit to me so I decided to pursue the job. What the job requires me to do to gather these activation codes is that they will deposit money in my bank and in return I have to withdraw some of it and deposit it to another bank account which they say needed to purchase for the bitcoin for activation of the codes of the employees. Remember there’s a list of missing column in the spreadsheet? She said that I will be needing those activation codes to fill that up. That moment, there was no turning back. They already deposited money into my account through wire transfer. So, I went outside with my 7th-month bump with pregnancy complications trying to walk the winter snow and ride a bus just to get to a nearby bank to withdraw the money they deposited to me and deposit it to somewhere else. It was done. I managed to do it and finished the task. When I got home they are asking me for my banking details so that they can pay me for the finished task. That was the most stupid thing I ever did. I gave them my banking details and the rest is history. I ended up paying bounced cheques and closing my account to avoid being delinquent. I even reported it to the police and fraud divisions but I didn’t get what I lost. That’s when I decided to give it all up, my dream of working from home. I thought it doesn’t fit me. And I thought like, I am a big joke that life throws everything at me. I stopped for some time until I gave birth. Being at home with a newborn is totally one of the priceless moment especially for a first-time parent. As days go by, you will be facing a surge of expenses, the output will always be more than the input. I figured, this time, I will need to learn how things going around in the online world. Until I found an affiliate program and learned how to build a website, affiliate marketing, SEO, niche, keywords, WordPress and all great stuff with the help of a great community, I figured, I moved on and ready to start again. After one month, the virtual assistant job contacted me for an interview this time around from Upwork. The contractor told me that she saw my website and very interested in working with me. 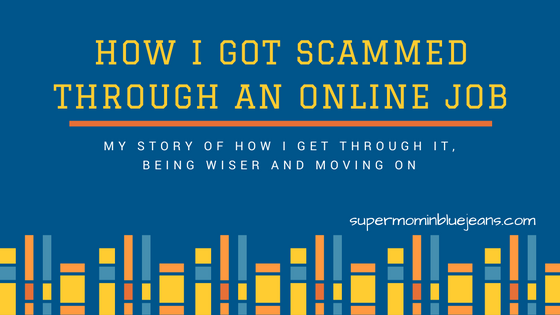 I was hesitated at first and scared to try it again but with the things I learned how to detect fraud and the knowledge that Wealthy Affiliate taught me, I decided to give it a try. Ever since then, I got VA jobs, legit data entry jobs, earning money from my very own website and I AM HAPPY. A lot of my friends are asking me, “Why don’t you give it up? You got scammed!!! Is it any worth it?” My answer is both a “No” and a “Yes.” No, I will never give up. I am earning through online, I get to stay with my son, I got the freedom I am dreaming of. Yes, it’s all worth it. The experience is very BAD when I started but with bravery and passion that you can do all things to succeed, you will never lose the game. I will end this post by giving some of my advice which I think will be an advantage of those who are applying for online jobs. How to know if the online job you are applying for is a SCAM? Scrutinize the job details. Stay away from offers that are too good to be true. Researching the particular company and finding out there really is a company doesn’t denote that the online job is legit. Like in my case, they used a certain international company. These fraudsters will do everything in their power just to lure the applicants. There are many ways they can lead you to wrongdoings like money laundering and shipping garments are the most two highly criminal act. Stay away that will require you from shipping anything, you might just be used for drugs transactions and end up in jail. In my case, I was used for money laundering. I even have to clear out my name, reported to the officials, made an official long statement of what happened — the most very disturbing and stressful you can think of! — and this is what you really don’t want to happen. What I’m saying is, if it deals with all those things, nope, don’t ever give it a try. View the profile of your client. Online working platforms offer this kind of feature. You will see from their profile that he/she has been around and hiring contractors and their reviews. You can see their contact details, company information, the previous jobs they had with other contractors, average pay they usually give and all that stuff. When you have an interview through Skype, you can see a real person, professional voice and get straight to what the job details are. The interviewer will also let you ask some questions. And most importantly, he will not ask you for your banking details or make you pay for any job registrations before you get to start to work. End up the conversation and move on. The very important thing is I invest in learning how to be competitive online. Message me and I would be more than happy to help you out for sure! My advice is if you really want to learn affiliate marketing, you should know that there are affiliate programs that will certainly teach you. It is really worth a try and will serve as your guide when you wanted to build your career online. Thanks for reading my post and feel free to share your experiences on how you got scammed to warn others as well in the comment section below. My TOP 3 Proven Ways How To Earn Extra Income Online Upwork Review: Why is it worth so much? Upwork Review: Why is it worth so much? Jezza, I feel so badly that you got scammed the way you did. I hope you didn’t lose to much money. At least you learned from that experience, and you’ll never let anything like that happen to you again. There are so many work at home scams circulating, so your blog post will be a helpful warning for those who are looking to try it. I’m glad everything worked out for you in the end. I absolutely agree with you. There are many people out there who are exerting every effort to have an online job leaving the 9-5 routine shift but if you are not wise you will get scammed easily. I really hope to spread the word and hopefully time will come that these scammers cannot longer do their trick because everyone knows what is best. Thanks for dropping by and wishing you the best! First I want to congratulate you for wanting to stay home and taking care of your child. It is something you will never regret. Secondly I like your website. You have a great command of the English language being that is your second language. The first page that it opens up to is about the data entry scam. It is heartfelt and the reader can easily connect with the story. I myself have looked for several online jobs and also found them to be shady. I like your review of Upwork. I also joined when it was called oDesk but that was it. It was not easy to use and I felt very unsure how to use it. You give great advice on how to get started with Upwork and I am going to take a look at them again. I also like your blogs about baby care. All in all I found your web site interesting and easy to read. Keep sharing personal stories it helps the reader connect with what you are writing about. I am wondering if there is a way to center your title on our page so it does not cut of Jeans. Good luck and enjoy your time with your baby. They grow up fast. Thank you so much and I really appreciate you also took your time to read my other posts as well. I am still working on my header image, no matter what theme I am using it still displays like that. I really love sharing my experience not to keep people nosy about my life but because I wanted to share what I have learned in parenting, building an online career and my passion as dietician to promote wellness. I’m so glad that you never gave up despite of what happened before. And I am happy to know that you are now with Upwork :-). I just want to know is Wealthy Affiiliate free? Hello Jaycee! Thanks for reading my post. My intention is to spread awareness among freelancers to be smart in choosing clients and jobs. 🙂 I am a Premium member of Wealthy Affiliate here is the link to my review of WA. Thanks and all the best!